We are very pleased to announce the date for our Holiday Dinner: Saturday, November 17th, 5-8 pm. Please note that this is a change from the date given in the last post; we have had to move the dinner to the 17th (instead of the 10th), and we apologize for any inconvenience and disappointment this has caused. We will have stuffed pumpkin with cornbread stuffing, mashed potatoes and gravy, fresh cranberry sauce, among other dishes still to be determined. For dessert, there will be tofu pumpkin pie as well as Alaine's Rainforest Cake (yes, the loaves pictured in the header of this website!). The price will be $35 per person. Please contact us for an invitation if you are interested, or have other questions, as this is not open to the public; we must confirm that you will be a guest. In other news, I will be a guest on "The Morning Blend" on KGUN 9 here in Tucson on Thursday, November 1st, at 11 am. I will be promoting the Health Fair that will be on Saturday, November 3rd at Our Savior's Lutheran Church at 1200 N. Campbell Ave, from 10 am - 5 pm. Sponsored by Healthy You Network, admission is free. 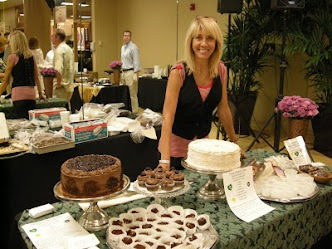 I will have a table of healthy baked goods for sale, and I will do a demonstration as well. We hope to see you, and as always, wish you good health!